I’m wholly prepared for this to come to a sticky end fairly soon . I have a feeling I’ve got off lightly because I wasn’t actually eating a huge amount of the ‘non-compliant’ stuff beforehand – we weren’t that carb-heavy in our everyday eating and I’d been eating more protein / good fats of late. But stay tuned; it’s entirely possible that by Sunday I’ll have turned into a fire-breathing demon. I think by week 2 we’re going to start missing dairy in particular – J is fairly attached to his coffee machine and the variety of milky drinks it magically conjures up, I love a good cup of tea, and we’re both fairly partial to a sprinkling of parmesan….on top of…well, almost anything, really. I really wanted to make sure our first week was full of interesting meals and tasty recipes, otherwise we’d never believe we could do it – or that it was something we wanted to stick out. 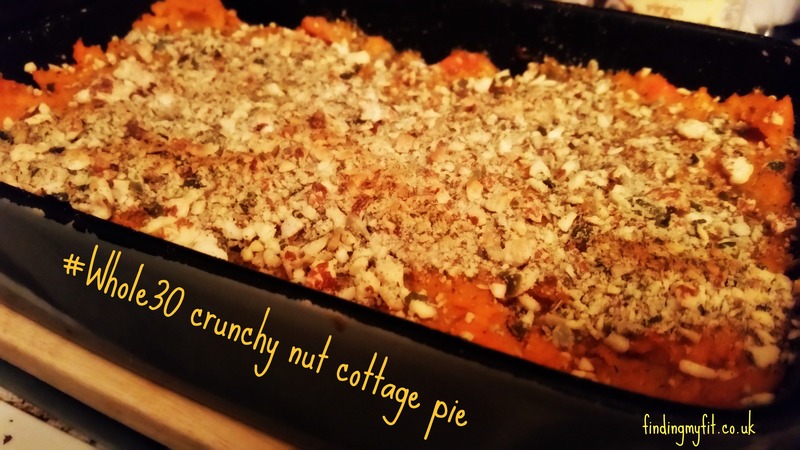 Tonight’s recipe was so yummy I just couldn’t resist sharing it with you! Fear not – no crunchy nut corn flakes were used in the making of this recipe. I wanted to re-create a hearty, home-cooked classic that fit within the realms of Whole30 / the Paleo lifestyle, but that is just as satisfying and comforting as the ‘real deal’. Now, I don’t know about you, but I tend to go for a generous (read, enormous) helping of cheese on anything oven baked. Not having the option for that, I wanted to find an alternative topping that added flavour and some interesting texture to a meal that risks feeling a little sloppy. Cue, my new favourite secret weapon; blitzed up nuts and seeds – it takes this dish from a weeknight staple to a firm favourite. Peel your sweet potatoes, and get them boiling on the hob. Preheat the oven to 200C / Gas mark 6. Heat the coconut oil on a medium – high heat on the hob, and add the carrots and onions. Cook them for around 5 minutes until they start to soften. While they’re softening, blitz the nuts and seeds together in a food processor for a couple of minutes on high until you have a nice chunky crumb mixture. Add the mince, and brown in the pan for 5 minutes until all the pink is gone. Add in the herbs and spices, chopped garlic and seasoning, along with the bay leaves. Simmer for another 5 minutes. Once your sweet potatoes are nice and soft, pop your beef mix into an oven dish, mash the sweet potatoes (add a little extra virgin olive oil and a pinch of cinnamon). Layer the beef mixture into the dish, and spread the sweet potato mash on top, followed by a generous grating of black pepper, then the crunchy topping. Pop it in the oven for 15 minutes for the nuts to brown, et voila! I guarantee you this is a filling, tasty dinner that can’t fail to satisfy. Serve with a good portion of greens and you’re good to go.